No one knew how long it had been there, buried deep beneath the trackless deserts of Ghaziben. Ten thousand years? A hundred thousand? Longer? However, when a massive sandstorm finally revealed the long-forgotten pyramid, it didn’t take long before the local inhabitants notice something. It bore the mark of the Ancients. The Ancients themselves were a mystery, wrapped in several other mysteries, and generously coated with mystery-sauce. It was known that they were responsible for the many ruined gothic cities, strangely medieval fortifications, forgotten scrap-yards, and most especially the sundry pyramidal objects found scattered throughout the Goatronium Expansions. Some said that they had harnessed the very power of Goatronium to make themselves god-like beings. Others asserted that their civilization had been destroyed in a vast accident when they tinkered one too many times with the volatile material. Some said they various resembled bipedal badgers. Some just made up outrageous things about them in order to sell large but scientifically-questionable coffee table books, or to appear on the various daytime videoshows. The point is, no one really knew. But such was the appeal of the legends that they were known and repeated throughout known space , in a thousand tongues, and even in places where the local inhabitants had no tongues at all. The stories gave rise to great books and famous plays. 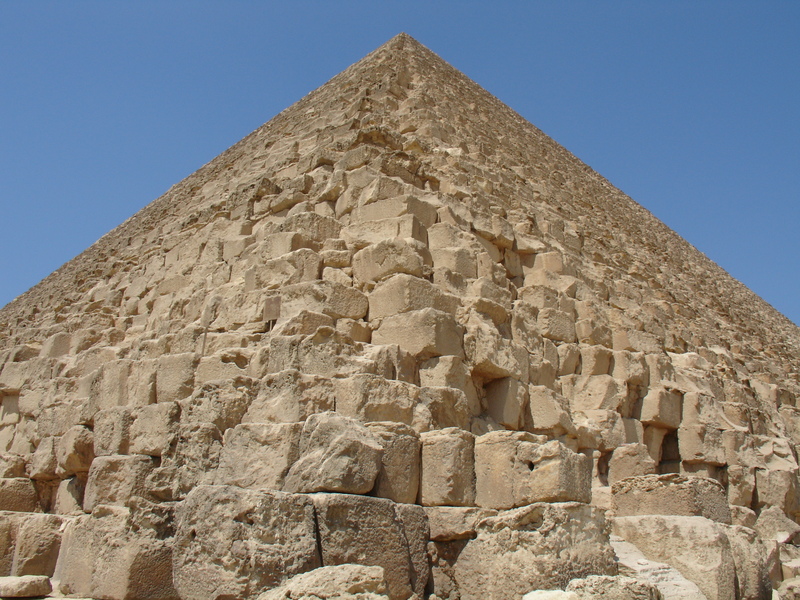 One popular fast-food restaurant chain even took an Ancient pyramid as its name and corporate logo. Would this newly-uncovered pyramid reveal the secrets of the Ancients? Did it contain, perhaps, some long-forgotten energy source of unimaginable power? A massively destructive weapon of some sort? The secret of eternal life? A horde of badger-sized clothing? Scores of adventurers descended on the nearby village, hoping to be the first to uncover the truth. The scoffed at the warnings of the local villagers. They trekked into the desert. Few were ever seen again. The deserts of Ghaziben, you see, were particularly dangerous. Powerful sandstorms that blotted out the sun could descend at a moment’s notice. Venomous sandspiders stalked the expanse. Most terrifying of all, giant sandworms could swallow whole any being unfortunate enough to encounter one. Yet when all these risks were calculated by the hybrid cybernetic consciousness of Necron, the utility function appeared positive: even if some warriors might be damaged beyond the limits of repair, the potential repository of information in the pyramid could well be worth the risk and anticipated losses. Accordingly, a Monolith was dispatched to secure the Ancient construction for closer inspection. The organic life forms inhabiting the nearby village would be little impediment, nor would the local fauna be allowed to interfere. They would simply be exterminated. 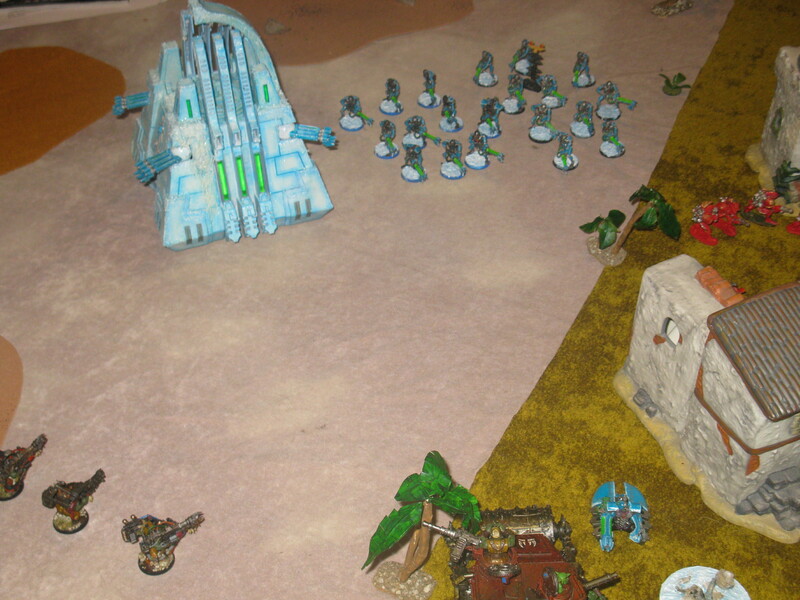 The Necron did not know, however, that another force was also headed to this same location: a large mob of Orks, fresh back from raiding several Imperial colonies. The Orks, ironically, were not lured by the possibility of Ancient riches, secrets, or technology. Rather, they had understood this particular pyramid to be one of those similarly named fast-food outlets, and were merely headed to Ghaziben for a snack. Deceptively quiet. 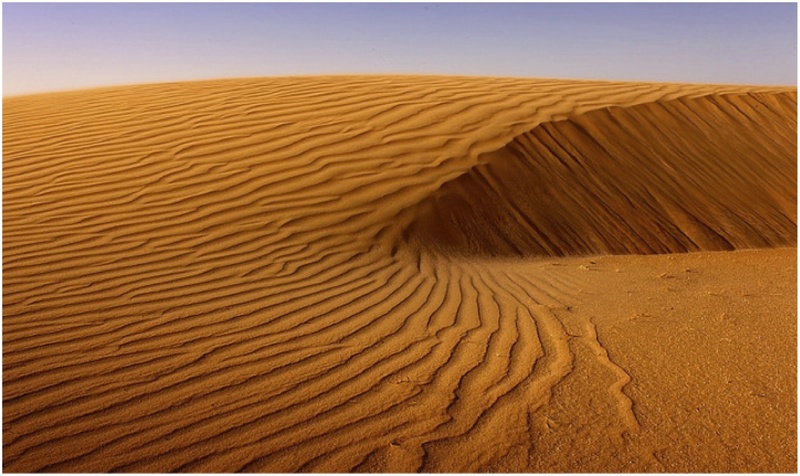 Nothing happens—any sandstorms end, sandspiders scuttle away, and the sandworm vanishes beneath the dunes. Mysterious tracks in the desert—what could they mean? Ominous clouds in the distance! Sandspider. Randomly select an area of rocky terrain, and place a venomous sandspider anywhere within it. Giant sandworm! Place the sandworm anywhere in the area of soft sand. Sandstorm! Use the night-fighting rules. If sandstorm is rolled when one is in effect, the storm ends. Next, any creatures should be moved 2D6 in a random direction. Sandworms will vanish instead if they encounter a patch of rocky terrain , the pyramid, or the green area. Sandspiders will vanish if they encounter a patch of soft sand , the pyramid, or green area. If the creature ends up with 4” of a unit (or another creature), it assaults such target. Sandspider: WS 3 BS 0 S3 T3 W2 I4 A2 SV 5+ poisoned weapon. There is only one giant sandworm—once killed, it cannot reappear. There is no limit to the number of sandspiders. Greenskin Big Mek Havaspanna Zyblot, having heard very bad things about Necron C’Tann, decided to deploy a very shooty army against the cybernetic enemy: a Shokk Attack Gun, loads of Slugga and Shoota Boyz, plus Deffguns, Lobbas, a Battlewagon, and squads of Kommandos and Stormboyz. The plan was simple: dakka da Necrons before they could do much damage. If the didn’t work, Quite-Old-But-Not-So-Old-as-Zogwort was along to turn the Necron god into a squig, if need be. 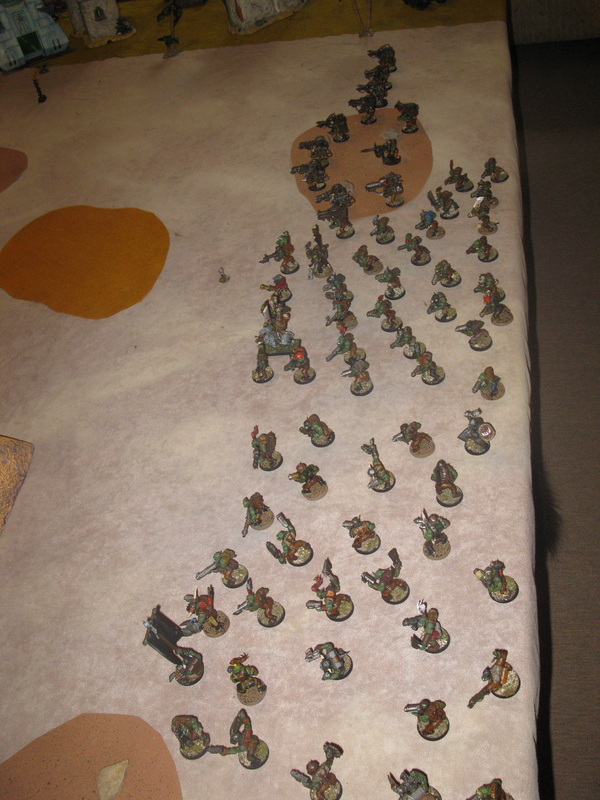 The game type was a pitched battle/seize ground. 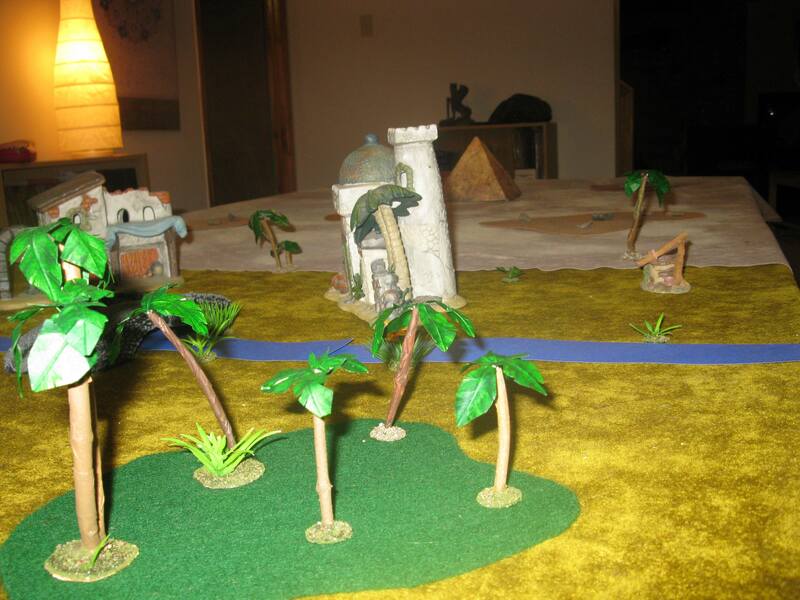 There were three objectives: the pyramid, the second near the Ork lines near the patch of soft sand, and the third near the Necron lines in the desert by the village.